Another program that we can use in our computer is called the Open Office. This program installed or we can installed in our computer is the same with Microsoft Office. This is intended once we cannot afford to purchase the Microsoft Office 2007 or 2010 or the lower versions. This is compatible with the MS-Office document source such as the .xls. There are only fewer changes of the navigation of the button because it is using a drop/down menu compared to the newer Microsoft Office friendly User Interface that using the tabulated menu. And also the command buttons of the toolbars it have fewer changes or difference. But if you have basics of the Microsoft Office, it is easy and can be manipulated readily and easy to familiarized. Now, to create this application that I would impart to you is the same with the Microsoft office. In how to highlights using the shift of the keyboard. In order to create a single worksheet table in a single workbook. It's also needed that you have familiarization of the parts of the User Interface. So that you can understand the instructions. Just follow the instruction below and look also the picture situated left side of this post. Once you finish to pagesetup, look for the A1 or the column A row1 of the worksheet area. Once you find it just type it there the Worksheet title of your report. Now position your Active Cell in the A4, now use the shift combination; shift + right arrow key to move the active cell to the right side to occupy the number of columns you need in your worksheet table. Then just hold shift key again and press the down arrow key to occupy the number of rows you need in your worksheet. 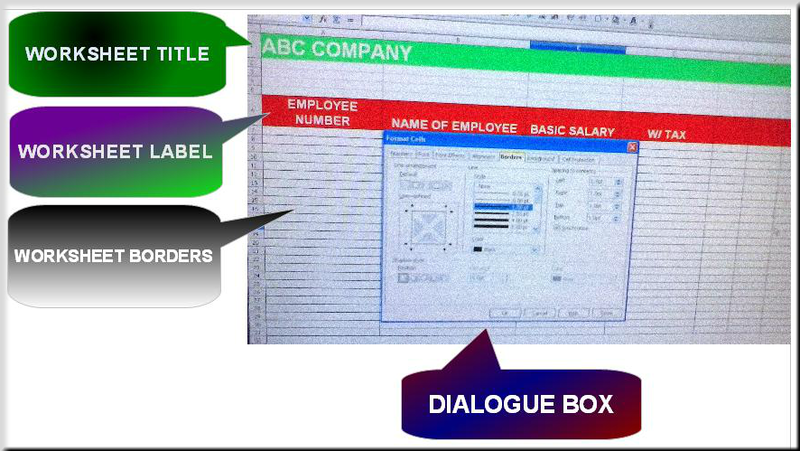 Now select a line style provided in dialogue box, preferably 0.05 and now click it in the left called line arrangement. And select " Set outer border and all inner lines. And you will see the borders of your worksheet table and your ready to insert and write the worksheet label of it's columns. Now after typing all the worksheet label, your ready for the alignment by wrapping the label inside of it's column. Just follow the instruction below. Click the drop/down bar of the text alignment. And click the center in the list options provide. And the right side also click the drop/down bar under the vertical. And select in the middle. Now check box wrap text automatically under the properties, situated below of the dialogue box. Now you will observed the both text of the label will move in the center of the column and row. Now you done. You can continue now typing the data of your worksheet. You can format the font style, size, and color of your both title and label.